Learning and teaching in no particular order. The role of rubrics in teaching is not up for debate. Complex tasks need to be analyzed by categories and clear criteria. However, I have found that they sometimes become little more than checklist of instructions on how to complete a task rather than tools for understanding, reflection, and assessment. My solution is to use blank rubrics. You might think that a blank rubric isn’t a rubric at all, and you would be correct if the purpose of the rubric were only to evaluate a learning artifact. If the rubric itself is a learning tool, then a blank rubric is a rich opportunity for discussion and critical evaluation. Summative assessment tasks, in particular, benefit from this type of rubric. The categories have been in focus throughout the unit, and have usually been assessed in a more prescribed manner in a previous task. As a summative assessment task should be an opportunity for students to exercise choice and creativity in how they present their understanding, it would be impractical to create specific criteria that could apply to any artifact. Students work in groups to experience a peer’s presentation of their learning and discuss the success of the artifact according to each category. 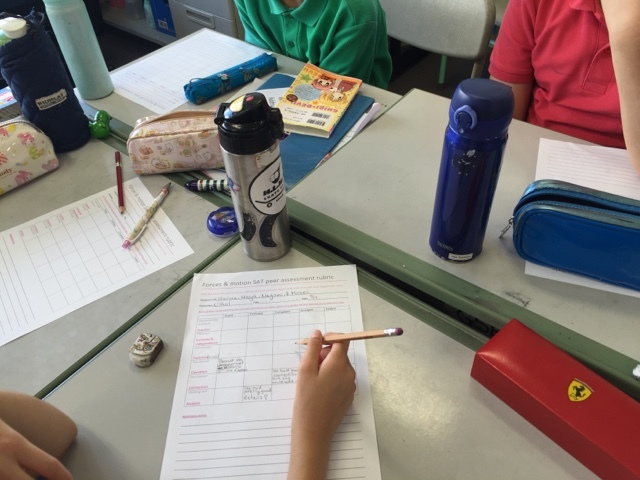 They agree on a score and write in the appropriate boxes the specific elements that support their evaluation. The assessments are completed in groups of three or four, so every presenter receives at least six separate rubrics which have been completed in this manner. The results are always honest and accurate, especially when averaged and analyzed in detail. When assessments seem mistaken or vary notably from the norm, a problem that often occurs when a group hasn’t focused or applied enough thought to their findings, a teachable moment to review the categories and criteria arises. I have observed that students enhance their conceptual understandings of a unit immensely through this process of peer assessment with creative negotiated rubrics. By definition, a generalist teacher is not an expert in any particular discipline. Fortunately, most of us are, and enrich our classrooms with our interests and passions. Unfortunately, the scope of a school year of inquiry stretches far beyond any one teacher’s expertise. Excursions and guest speakers can make up the difference, and video communications technology makes it possible to bring experts into the classroom from anywhere. Near the conclusion of a recent unit which focused significantly on advertising, it occurred to me that one of my friends, Adam Lisagor, is the founder and owner of Sandwich Video, one of today’s premier creative advertising organizations. It only took a few text messages and time zone conversions to have him on the big screen in the classroom. To prepare students for the interview, we first viewed several of Adam’s videos, then set a home learning task to explore more. Then, I asked them to submit questions via an online form so that I could sort and select in a way that promoted a conversational mood. As questions were chosen, students approached the camera one at a time to speak with Adam. Not surprisingly, their questions were insightful and elicited excellent comments on persuasion, honesty, and creativity. In addition to an excursion, I would attempt to schedule a guest speaker, either in person or more likely via video, for every unit of inquiry. Data has been an undercurrent in my teaching since my first classroom in 2007. Of course, in that year, I struggled to gather data and there was virtually no chance of utilizing much of it to inform and enrich instructional planning. For good or ill, data is not essential to the survival of a first year teacher. Each year after, I slowly improved, including a variety of experiments like the one shared in the post Student Empowerment | COETAIL final project. I tried different forms, organizers, notebooks, etc, until finally unveiling an integrated digital system last year. I shared it as a presenter at the GAFE Summit 2016 in Kobe, Japan, and used it for the school year to publish students’ ongoing assessment data, and other key information such as website usernames and passwords, directly to them as web pages. After celebrating and discussing the system, I felt that it was terribly unsatisfying. Inspiration came in the form of media such as Jack Norris’ keynote presentation from Strata + Hadoop World in San Francisco, Let’s Get Real: Acting on Data in Real Time, embedded below. The concept of ‘data agility’ through converged data and processing appealed to me because what I sought a tool which would organize all assessment data in a way that could be searched, shared, and analyzed. Over the years I had been introduced to many ‘tracking systems’, only to discover that they were utterly unmanageable at scale. Ticking boxes on scope and sequence documents or highlighting learning objectives almost arbitrarily seemed like a show at best. In fact, a colleague who shared such a system with me admitted that at the end of a term, due to a lack of hard data, he would simply choose outcomes to highlight on every student’s document regardless of their actual progress or learning. To quote Mr Norris, I wanted my data to ‘get real’. While designing my own system, I became somewhat of an amateur data scientist. The implications of the article Putting the science back in data science got me thinking about the flow from data entry to visualization and publishing. A quote from the post Can Small Data Improve K-12 Education? helped to clarify the objective for the project. What I wanted to do was bring transparency to the relationships between myself, students, parents, and administrators. Further readings within the big data and data science trends like Data Quality Should Be Everyone’s Job by Thomas C Redman directed my attention toward the purpose for the data. Before data is collected, it should already have a purpose, and that purpose dictates the design of the collection, publishing, and analysis tools. The next piece of the design puzzle was my school’s Assessment Handbook. In it were the categories, criteria, and descriptors on top of which my system would function. Utilizing a system of Google Sheets, data is entered and student progress viewed in potentially real time, depending on the efficiency of my data entry. As we began using the system I shared a video, Tour of your data book, embedded below, which illustrates the details of the user experience much better than I can describe in words. This system has been remarkably effective and unlike last year, I only plan to make minor tweaks, especially to the user interface. Feedback from students and parents revealed, as I expected, that there are too many graphs and that it’s difficult to know which are more or less important. Another feature I plan to add is a Google Form which mirrors the data entry document which would allow teaching assistants, specialists, and even parents or students themselves to contribute data to the system. If articles like The Three Ways Teachers Use Data—and What Technology Needs to Do Better by Karen Johnson and 7 Steps to Becoming a Data-Driven School by Eric Crites are any indication of the direction that data utilization is heading in education, I’m glad to be along for the ride. Action is the one component of the IB Primary Years Program that is expressly difficult to implement and document. When I started at KIST, there was an opening as the Elementary Student Representative Council facilitator. Although I was reluctant to take on extra roles in my first year at a new school, my background in service learning motivated me to volunteer. Since then, I have slowly transformed the culture of the ESRC into an authentic service learning experience. One of the initial changes was to change members every quarter. This was done in order to provide opportunities for four times as many students per year to participate. I view each quarter as an iteration of the design thinking process, or more specifically, service design. The process begins by raising questions and surveying the elementary student population about their views on how the school might be improved. ESRC members speak with their own classes, and older representatives visit younger classes. Their suggestions and concerns are discussed in a subsequent meeting to identify a service goal. In addition to speaking with their classes, each iteration of the ESRC conducts at least one meeting with the Elementary School Principal. The format and purpose of these meetings will continue to evolve, but their efficacy in promoting confidence and sense of purpose is invaluable. Details of all meeting notes are kept in an Excel workbook with a new sheet added every quarter. In the article Community Service Ideas for Youth: Why Giving Back Matters by Marilyn Price-Mitchell, PhD, the focus for elementary students is on learning to be responsible. However, the ESRC at KIST is voluntary and the expectation of responsibility is made clear to prospective members before they join. Our focus is on growing as Communicators. Members use a private email group to communicate with each other and a public (within the school) group to stay in touch online. I found that the emphasis on communication whether through meetings, speaking to large groups, and creating posters and other visual media, shifts the students’ attention from ‘learning to be responsible’ to needing to be responsible to take and illicit Action. Our successes have included helping a Grade 2 student to persuade the school administration to install a Friendship Bench and sponsoring a Pink Shirt Day. Perhaps as our routines become established, I would consider developing a portfolio and badging system like the one described in Adam Hill’s post, Action and Service Volunteers. One of the best ways I’ve found for infusing inquiry into my approach to teaching mathematics is to introduce new topics and concepts with a challenge. 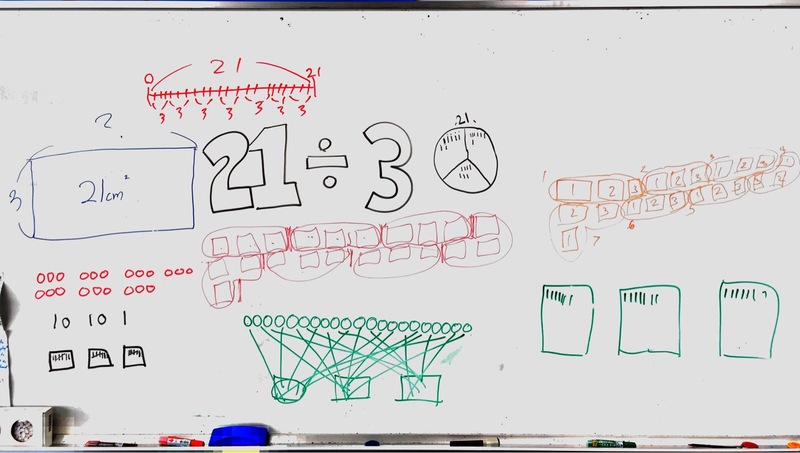 Recently, we explored Division by asking volunteers to share on the whiteboard techniques for visually modelling the division expression 21÷3. review learning that may need to be refreshed before engaging more deeply. This year, my Student Survey results held few surprises (link to view last year’s Student survey analysis). Items directly related to me, such as ‘My teacher cares about me’, were positive. Generally, 70-80% of students answered ‘usually’ with very few, most often only one student, answering ‘no’. One surprise was the response to the statement, ‘My teacher listens to me.’, to which 48% of my students think I only ‘sometimes’ listen to them. Slightly baffled, I reflected on my practice and identified a few of my behaviors that could lead to this result. First, as a rule, I ignore students when they suddenly shout across the classroom, begin asking a question without saying ‘excuse me’ or otherwise catching my attention, and especially interrupt other students. I can easily understand how a child could perceive that I am not listening to them because in some cases, I intentionally don’t listen in order to cultivate a culture in the classroom of politeness. Of students who responded ‘sometimes’ or ‘no’, their overall average response was only 69% positive, meaning that those who responded negatively to this item were also negative to most of the other items. Of those who don’t feel that I ‘usually’ listen to them, 69% also don’t feel free to ask and answer questions, a tenuous correlation. As a simple action plan, I would follow the steps below. 1 Observe if and when I don’t listen to students. 2 Make more explicit that I sometimes ignore students speaking to me if they are acting disrespectfully or impolitely. 3 Reinforce our classroom essential agreement – which was composed, synthesized, and signed by all of the students – about being Open-minded Communicators. We have a right to share our opinions and feelings. We have a responsibility to show respect by listening and practicing empathy. I would also note that of all of the classes I have taught in nine years, this is by far the most needy. During any written assessment, there is a constant queue at my desk and barrages of hands in the air asking for help. My email box is also consistently populated by emails from students asking to send PDFs of lost homework and other requests for favors which I politely decline. It is possible that their concept of the role of a teacher is significantly different than mine. Almost everyone in the class chose to do an oral presentation with a poster or PowerPoint for visual support. The remaining two students submitted written reports. Although this may only be a case of carefully reading and following instructions, I feel justified in being somewhat annoyed. Only two students think that their peers ‘usually’ treat each other with respect, and almost a quarter feel that their class is always disrespectful. The same holds true for their perceptions of classroom behavior. When I asked if anyone wanted to learn in a class like the one shown above, no one responded. I have discussed these results with my grade level team, administration, and the precious grade teachers. All assured me that the students’ feelings about their community are absolutely about complex social dynamics. In brief, this class has too many ‘alphas’ and not enough empathy. This is a case study to test my ability to cultivate social and emotional intelligence. And a fair and timely challenge it is. A future post will detail the reflection and data informed action plan I have set into motion to help this learning community to become more Caring. I would certainly appreciate anecdotes and suggestions that might more brightly illuminate a path forward.